Start a girl-only scooter club. Here are three bags made by “Fluff”featuring a lot of scooter girls! At least for a rally or two. The Laptop Bag is $36 and measures 15″ x 12″ x 2.5″. The Train Case is $26 and measures 8.75″ x 6.25″ x 6. And the Cosmetic Case is $14 and measures 8″ x 4.5”. 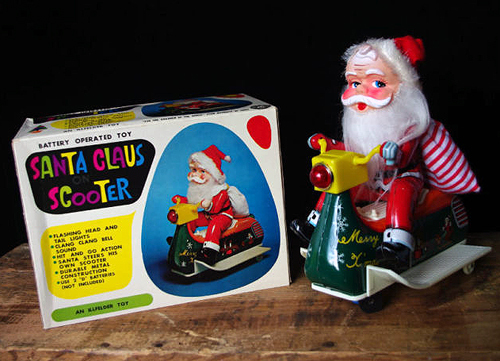 Some will decry my posting of this toy as it’s not technically a scooter scooter but it’s so weird and wacky I couldn’t resist. Battery operated and made in Japan, these can be found on eBay and usually go for $100 or more depending on condition. These can be found at some Barnes & Noble stores and possible online but I have struck out so far. Good luck! Need to air your personal laundry? 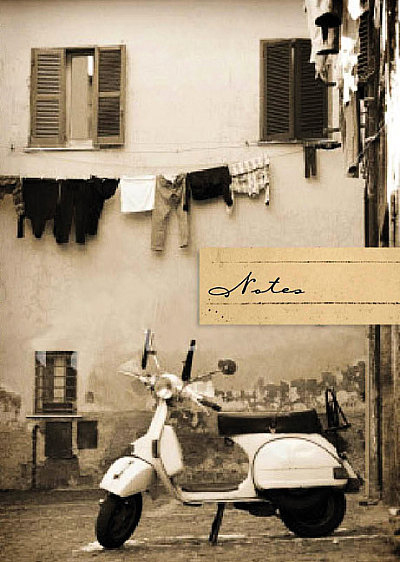 Here’s a nice notebook to record all your musings and rants. It’s $14.50, 144 pages and measures 8.25″ x 6″. And available for online purchase at Portland’s beloved Powells Books. 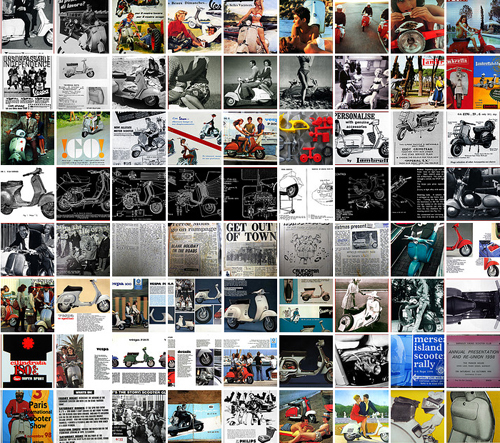 Here are the best sites I’ve come across with vintage scooter images and ads. Lots of good mining here for crafters and collectors alike! Thanks to Joe B. for some of these finds. Where to even begin with this one? 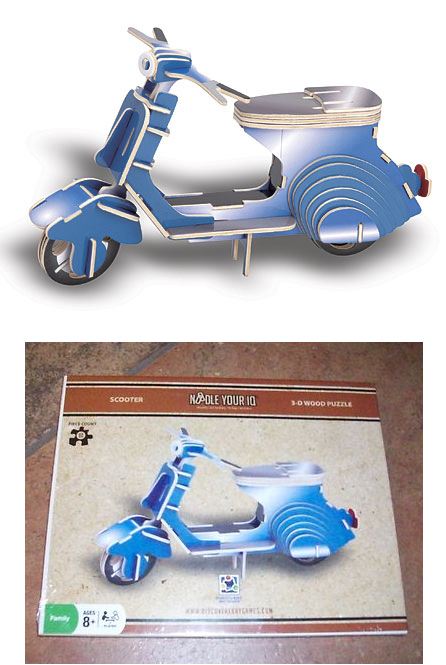 We’ve featured other Bradford Exchange Limited Edition Lambretta collectibles here before including, of all things, a Faberge-type musical egg (?!?) but this clock beats all for outrageous swagitude. Alas, it doesn’t appear to be available at the Bradford Exchange site anymore. But if you want one, prepare to pay at least Â£125 for one. Thanks to Julie G. for the photo and this find! 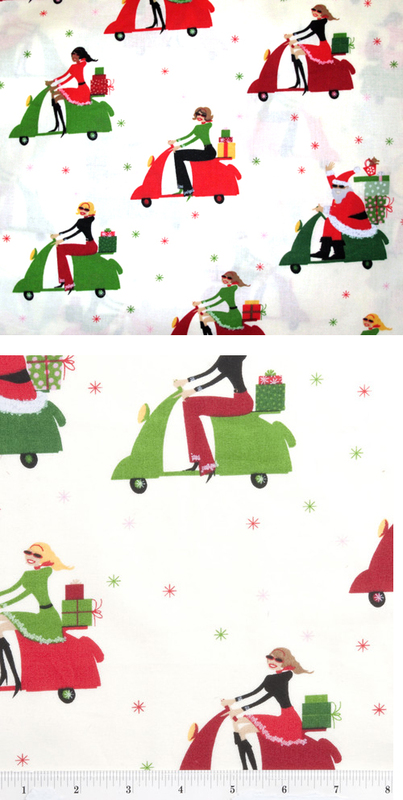 Santa Scooter A Go Go! Well darn me. I think I’ve waited too long to post about this fabric. The Jo-Ann Fabrics website says it’s no longer available. But it may still be available at some of their stores. Take a peek and let us know if you have any success. Thanks to Gretchen W. for this great find. 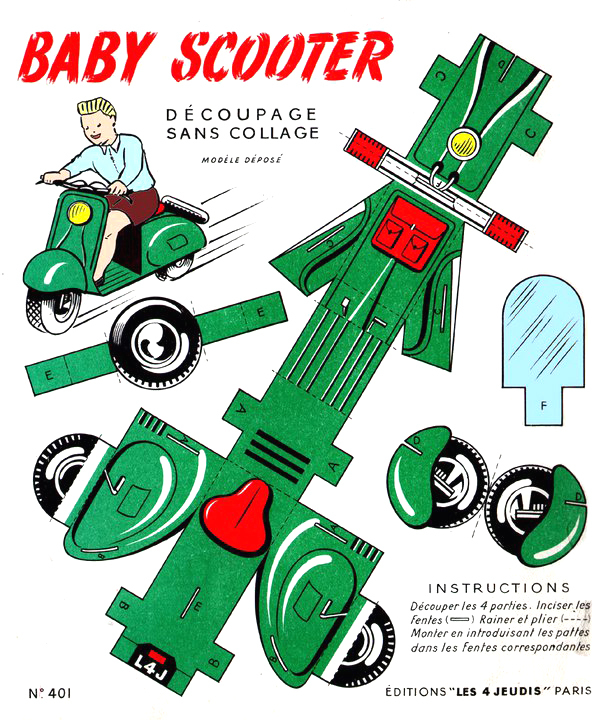 Calling all Scooter Nerds (and their bairn)! Target should just get it over with and change their red and white logo to the mod rondelle. 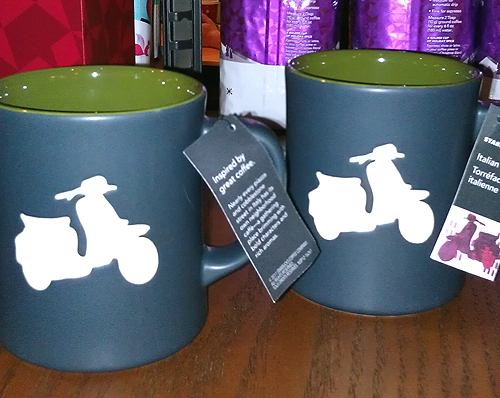 They consistently have lots of mod themed and scooter stuff in every aisle of their wonderful store. The latest proof: The Harajuku Mini clothing and accessories collection. The scooter â€” with training wheels! â€” makes appearences throughout the “Nerds” theme of this line. Designed by Gwen Stefani who had the same designs in adult sizes back in 2008 and covered in this post here. The sizes for this clothing are a wee bit smaller, fitting newborns and toddlers. Prices are very reasonable with $19 for the coveralls and $13 for the shirt shown here. Stores will no doubt carry other styles, sizes and even school supplies with this design so explore your local Target soon! Thanks to Tammy for the in-store photos and this find!